AmazonFresh is, still, on a very long journey to finding the right business model and the right pricing to go along with it. The newest change a few days ago: Dropping the price to $14.99 per month in the U.S. Compared to a $299 per year this new monthly price looks like a deeper price cut than it actually is. (It still amounts to $179.88 per year.) But the main point here is that a monthly fee is far easier to swallow than a yearly upfront fee that high. 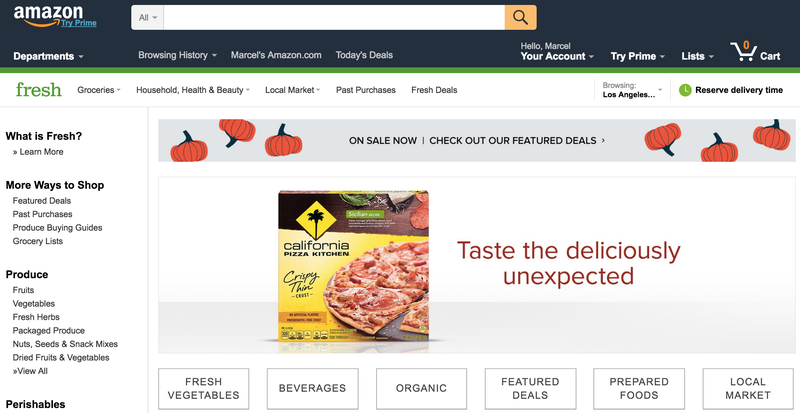 AmazonFresh was made available for a $7.99 per delivery fee in select California markets last summer, on top of customers’ $99 per year Prime membership. Previously, AmazonFresh was a much steeper $299 per year, though Amazon had delayed its plans to start pushing members to upgrade. (This option was still available for non-Prime members at the time of the shift to the $7.99 per delivery fee). This includes the company’s more recent expansion into Boston, as well as other markets like Baltimore, Seattle, parts of California (L.A., Riverside, Sacramento, San Diego, San Francisco, San Jose, and Stockton), New York metro, Northern New Jersey, Philadelphia metro, Northern Virginia, Stamford, and Trenton. Outside the U.S., the service is available in London. Amazon notes that customers are also eligible for the Fresh Add-on, even if they subscribe to Prime on a monthly basis ($10.99/mo). For those customers, the combined price of Prime and AmazonFresh would be $25.98 per month, but billed separately. Unlike grocery delivery rivals like Instacart, Shipt, or Peapod, for example, which have partnered with local grocers so their employees and contractors can shop their stores, Amazon had instead invested in refrigerated warehouses and inventory. This has slowed its ability to expand as quickly as others. ​I am not saying these startups are more likely to succeed than Amazon. They may very well not. I am saying a more modular approach for a big player like Amazon might work better. Online groceries shopping as a platform, if you will. In the UK, Amazon Fresh is available, in London, since June of this year, for £6.99 per month. Is the Concept Behind HelloFresh Going to Crack the Online Food Market?